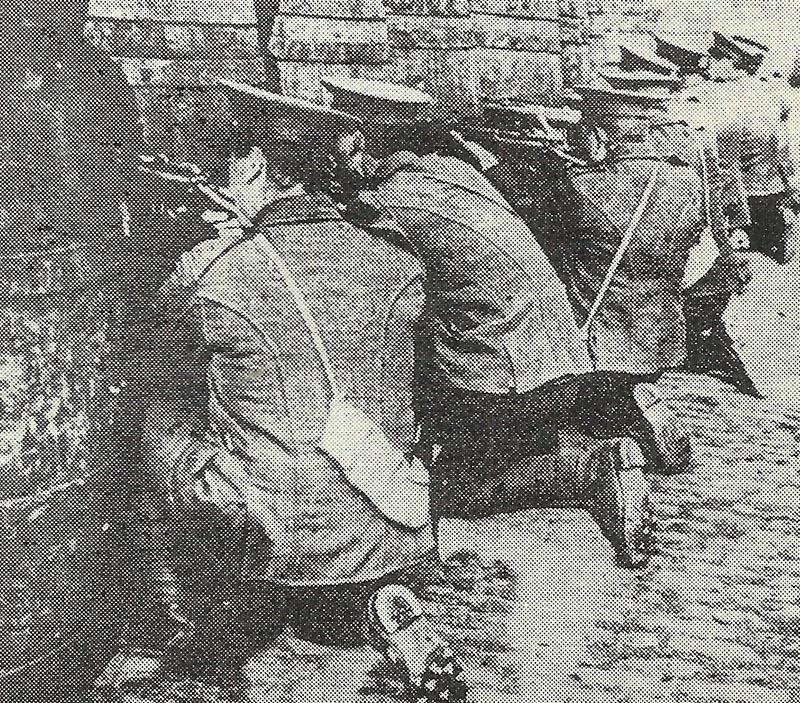 British infantry fire on the Four Courts – a central Irish rebel strongpoint in Dublin. Ireland, Easter Rising: Martial law in Dublin. Britain: Parliament secret session postpones call up of married men 27-35. Aisne: After 8-hours barrage 3 French battalions fail to regain ground lost on March 10 until following day, General Mazel suspends operation. Balkans: Joffre writes to CIGS (Chief of Imperial General Staff) Robertson suggesting Salonika offensive as soon as Serb Army arrives, argues Rumania will come in as a result, but British only acknowledge on May 3. East Africa: 1st British division through train from Voi reaches Moshi thus joining the German Usambara or Tanga Railway. North Sea: 4 battlecruisers (under Boedicker, because Hipper is ill) shell Great Yarmouth and Lowestoft (20 civilian and 3 military casualties, c.200 houses destroyed) for 20 minutes. Yarmouth’s shelling shortened by Harwich Force intervention (flagship cruiser Conquest sustains 5 hits, 25 killed). Cruiser Penelope torpedoed by German coastal-submarine UB29 on way home but towed into Chatham. Western Front: 16 Anglo-German air combats. Royal Flying Corps aircraft and balloons range 72 artillery targets (65 on April 28, 49 on April 29). Coal for Scandinavia not to sail in neutral ships unless with Allied return cargoes.